Here we will bring you an introduction to one of the greatest creative geniuses of all time, Ludwig van Beethoven. (born Bonn, baptized 17 December 1770; died Vienna, 26 March 1827). He studied first with his father, Johann, a singer and instrumentalist in the service of the Elector of Cologne at Bonn. As a teenager he went to Vienna, where he settled. He pursued his studies, first with Haydn but there was some clash of temperaments and Beethoven went on to study with Schenk, Albrechtsberger and Salieri. Until 1794 he was supported by the Elector at Bonn but he found patrons among the music-loving Viennese aristocracy and soon enjoyed success as a piano virtuoso, playing at private houses or palaces rather than in public. His public debut was in 1795; about the same time his first important publications appeared, three piano trios op.l and three piano sonatas op.2. As a pianist, it was reported, he had fire, brilliance and fantasy as well as depth of feeling. It is naturally in the piano sonatas, writing for his own instrument, that he is at his most original in this period; the Pathetique belongs to 1799, the Moonlight ('Sonata quasi una fantasia') to 1801, and these represent only the most obvious innovations in style and emotional content. These years also saw the composition of his first three piano concertos, his first two symphonies and a set of six string quartets op.l8. At the age of 32, he began to notice an impairment of his hearing. Gradually as the years passed, depression overcame him much of the time. However, his focus upon music gave him some solaee. 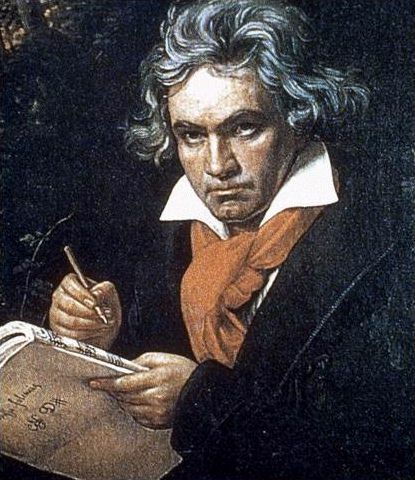 The interesting thing about Beethoven's deafness is that since he could not hear the creations of other composers, there was little influence upon him from the outside. The compositions of the latter part of his life, including the last string quartets, the 9th symphony and the Missa Solemnis were basically created from within is silent world. They are astonishing works of great power, and of an almost visionary nature. The striking nature of his symphonic works intimidated other composers for many years because no one felt that he could live up to what Beethoven did. Johannes Brahms waited until 1876, when he was in his 40s (and 49 years after Beethoven's death) to write his first symphony. It was often referred to as "Beethoven's 10th." Here is a sample of Beethoven's most expressive music, the opening of the Piano Sonata no. 14, which was nicknamed, the "Moonlight" Sonata. Listen! No doubt you found that a rather serious bit of music; it is nevertheless beautiful. You'll encounter more music Beethoven in the classroom from time to time. The pianist was Alfred Brendel. Label=Philips Catalog number 464680. Go back to initial page of site.